Atlus announced the first DLC addition for Dragon's Crown this morning, alongside word that it will be a free download for a limited time. 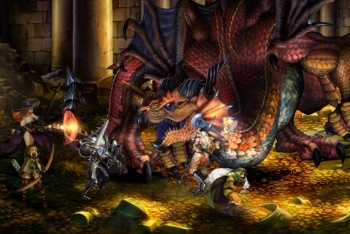 Dragon's Crown, an upcoming stylized beat 'em up from Vanillaware and publisher Atlus, won't hit store shelves until August 6, yet we're already hearing word of the game's first downloadable addition. Appropriately dubbed the Voice Pack, the $2 DLC is said to "offer players the ability to customize their story with different narrator voices from each of the six playable characters in the game: Amazon, Dwarf, Elf, Fighter, Sorceress, and Wizard." These voices replace the game's default narrator with your chosen character, adding a bit of customization to the game's plot for those who find themselves particularly attached to any one of the game's six ambulatory fantasy tropes. Oh, but that's not the best part. According to Atlus, the Voice Pack DLC will debut alongside Dragon's Crown on August 6 and for the first month of the game's existence players will be able to download the Pack for the very attractive price of absolutely free. After that month the Voice Pack will revert to its standard $2 price point, so I'd advise you to get the thing while the gettin's good.